The Fourth Estate, triumphant! 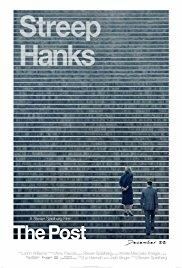 Steven Spielberg’s The Post is a historic biographical drama depicting the story behind the infamous Pentagon Papers that set a monumental precedent in the US Supreme Court following a ruling in the favor of the freedom of the press. Probably the most significant ruling affecting journalism, this film goes beyond the cold, hard facts of the case and into the offices and houses of those who were responsible for shedding light on the lies the US government was spinning to keep the War in Vietnam going. In a manner of speaking, this film could be read as Spielberg’s ode to US journalism, and by extension, to the free press at large. While traditional ink and paper newspapers may be slowly becoming a thing of the past, Spielberg’s film shows that the press has an important place in a democratic society. Without the free press, a nation’s government could easily lie and maliciously mislead its people to serve its own gain. No surprise, Meryl Streep’s and Tom Hanks’ acting is simply brilliant; while the rolls may not seem incredibly complex, it’s the beauty in simplicity that demonstrates the excellent commitment to character that we all have come to respect over the years for these Oscar-winning actors. The Post is a historical drama brought to life for the screen through precise editing, beautiful cinematography, and a gripping score. Unrest grows at home while the US is deep in the middle of the Vietnam War. With conflicting reports coming out of the warzone, the people of the United States have only the word of their government to assure them the war is going well but they have to continue sending the boys overseas to “win.” After a rogue journalist leaks papers from the Pentagon describing how the US is losing and it keeps sending boys overseas to keep up appearances to the New York Times, the attorney general places a restraining order on the iconic newspaper to prohibit it from publishing the classified material. After word of this unprecedented extension of power, the editor-in-chief of The Washington Post Ben Bradlee (Hanks) comes to have a copy of the papers and desires to publish them in order to show the American people what the government has really been up to. Only one small problem, the owner of The Washington Post Katharine (Kay) Graham (Streep), the first woman to own a major newspaper, is unsure if the papers should be published because she seeks to take the paper public and this could damage that–not to mention that she and Bradlee could go to jail. Go beyond the pages of a history book to witness the thrilling drama unfold as you find out just why The Pentagon Papers was such a big deal. Usually, there is a particular scene that evokes strong emotion, perhaps it’s a powerful monologue or heated emotionally-driven exchange between two characters, there are other methods for evoking an eruption of feeling and emotion within the mind and body. Never once did I feel my emotions run high with this film. And I happen to be an entertainment journalist, I teach media writing at a popular university, and spent time in broadcast news. I have a love for the media, the press, and publishing. I also spent time in a media law class in graduate school analyzing the very papers in question, and I still did not feel emotionally woken up by the film. I find the film very well written, produced, shot, directed, acted, scored–everything is done with extreme precision. But, that’s what I have come to expect from Spielberg, Streep, and Hanks. Yes, to be able to consistently deliver excellence is nearly uncanny; but when I know what to expect, it’s much more difficult to surprise or wow me. That’s what is missing from this film in my opinion–the wow factor. On the socio-political spectrum, I find the commentary on women in leadership is brilliant! Quite happy that the film chose such an incredible woman’s story to tell so cinematically well. The character of Kay Graham is not only an inspiration to aspiring female leaders, but she is an inspiration to all who find themselves in positions of influence or power for which society does not feel he or she is suited. Whereas this prejudice can affect men and women, history has shown that is has affected women more. And this film is a breath of inspiration for young women who will become future leaders around the world. Brave. Kay Graham was an incredibly brave woman who fought the good fight and proved that she could make the tough decisions that are required in order to grow a company. I also find that The Post serves as a beacon of hope that the press is here to serve the American people in a day and time that our government’s leaders claim that the press at large is “fake news.” Newspapers are here to serve the governed NOT the governers. Let the Pentagon Papers be a sign that our leaders are not past deception even if it means sending our military to certain death in order to keep up appearances. The Post is definitely a movie that all journalists should watch. And not just “conventional” journalists. But anyone who takes part in publishing written, audio, or video media content. Especially those who cover governmental affairs should watch this historical drama highlighting a huge turning point in the freedom of the press. I think my problem with this analysis is that it basically penalizes Streep, Speilberg and Hanks for being amazing. You are saying that because you already expect greatness from them they need to be extra great for you to find it worthy of accolades. What if this movie was full of unknowns? Would it be Best Picture worthy then? They weren’t trying to do anything other than what they do and deliver by default. So yes, it comes off as par for the course. And I believe they could’ve reached for something different and greater. It’s ultimately unimpressive. Excellently made. But nothing truly memorable.